Thursday, in her home in Los Angeles Lindsey Barrow declared San Diego the capital of Nevada. This is an unprecedented move that some have called “out of her jurisdiction” and “who is Lindsey Barrow”. But Barrow feels this is the only way to find peace between Californians and Nevadans. “Previous administrations have tried to create peace in the southwest by letting the states take care of it themselves, but that’s not my goal. As a person who advocates for states’ rights and less federal government, I decided I would federally tell another state that they are now ruled by a separate state’s government”, Barrow stated after showing us how many marshmallows she could put in her mouth (the answer is two). A fifty state solution has long been the preferred answer to the United States problem and never have two states gone back to being one state. Look at North and South Dakota, Virginia and West Virginia, North and South Carolina. They’ve never gone back to being Dakota, or Carolina, or Virginia …. whatever you get it. But Barrow believes they should. “Before this year is through I’ll have gotten rid of all the north / south / east / west divides in this country. Starting with the East Coast and ending with the North Face” said Barrow. When asked why she would do such a thing, she reiterated that she could probably put more than two marshmallows in her mouth but she just didn’t feel like trying earlier. 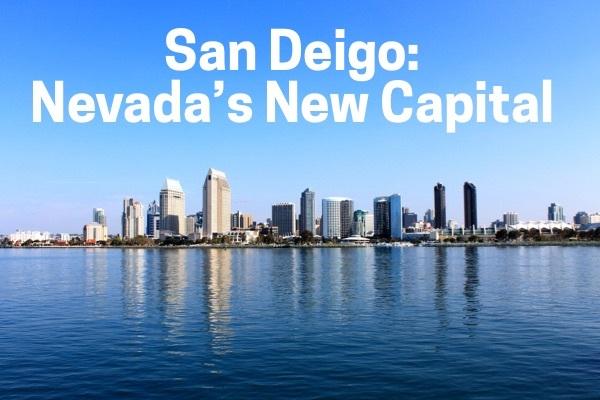 Why Make San Diego the Capital? Some might ask why San Diego would want to be the capital of Nevada. “But those people don’t get the cultural significance of San Diego. And I really get it, because I went to San Diego once. They have an aquarium. I didn’t go. And a big zoo. Didn’t go to that, either. But I’ve also been to Nevada twice. And I think Nevada could really use some of that San Diego zoo culture. I didn’t see a sign for a zoo in Nevada at all.” When Barrow was reminded that the animals in the San Diego zoo wouldn’t do well in the Nevada environment, she screamed fake news, grabbed her bag of marshmallows, and said the interview was over. Which was weird, because it turns out she was interviewing herself. Previous Article← What Actually Is All This?